We stopped at our hotel, The Crowne Plaza, Nieuwe Zijds Voorburgwal 5, very well located near the Central Station, to drop-off the luggage. It was early morning and while the rooms were being made ready, a canal cruise had been planned. The personable Alfred was at the helm to steer us through the beautiful tree-lined canals and it was a delight to sit back and gaze through the glass sides and top of the boat at the architectural treats along the bordering streets. We passed rows and rows of gracious gabled homes (some are now hotels and offices), 17th century warehouses and public buildings. These precious waterways are also home to colorfully decorated houseboats, which add a touch of humanity. Our one-hour trip was just a brief look at the canal system and the inner city. The canals extend throughout every part of old Amsterdam. The main canals wrap around the historic city center in a series of semi-circles and together with the smaller canals that crisscross them, a boat can move easily between all parts of the city. There are more than a thousand bridges for cars, bikes and pedestrians linking the busy streets. In spite of our jet lag, some of us still had energy to burn. Linda and I were on the hunt for the perfect pair of Mephisto shoes, which sell for about half the price in Europe of what they cost in North America. So we had our destination and together with Larry we decided to start with a stroll through the Jordaan. The Jordaan had been a neighborhood comprised mostly of immigrants. This cultural diversity has somehow survived as the quarter evolved to become home to students, artists and the new wealthy. Nowhere in the city does the relaxed, tolerant, anything-goes atmosphere come to life as it does in the Jordaan. Cafes and restaurants are a large part of the social scene where residents and visitors alike can enjoy a fine meal and, when the weather permits, sit outdoors enjoying the neighbors and the neighborhood. We stopped into a typical brown cafe (refers to the brown walls from years of being smoke-filled), Cafe de Zaterdagse Brug, Lindergracht 103, for a light lunch of the daily tomato/vegetable/meat soup. The lone waitress was quite personable and soon got busy serving beer and soup to the patrons who followed us in. Typical of these cafes, they all knew each other and engaged in lively conversation, while throwing us nice smiles to acknowledge our presence. The Jordaan, like most working class communities, was fiercely independent. Its inhabitants, ready to help each other and passionate in their beliefs, were willing to fight for a cause. They staged one of the few public demonstrations in all of Europe against the Nazis' persecution of the Jews, a courageous act of defiance. 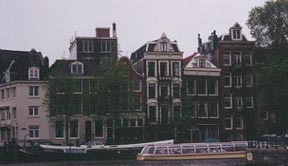 The borders of Jordaan are Brouwersgracht, Prinsengracht, Lijnbaansgracht and Elandsgracht. We continued south along Prinsengracht, captivated by the serene beauty of the canal and buildings. Unfortunately, the Mephisto store did not have the style Linda was looking for nor my size in the style that I wanted - so the search would continue. Back at the hotel, our modest-size king bedroom was awaiting us. The furnishings were elegant and the nice-size bathroom had excellent amenities. Speaking of king bed, we fell asleep at 16:00 and didn't awake until our morning call at 06:00. The buffet breakfast in the lovely Brasserie was superb, with a vast array of well-prepared and presented selections and a cheerful, helpful staff. On the bus at 09:00 for a city tour, our first stop was the Anne Frank House where we saw the place where Anne and her family hid with the help of the non-Jewish office personnel. We read excerpts from Anne's diary, a grim reminder of the horrors of World War II but also a testimony to the bravery of the Dutch people who risked their lives trying to save lives. At the Anne Frank House, keeping the memory alive is directly connected to the concepts of freedom, human rights and democracy. The Anne Frank House hopes, with the work it does, to inspire people from all over the world to become actively involved preserving these ideals. Descendants of the victims of the Spanish Inquisition who wanted to live as Jews, came to Amsterdam. At that time the Dutch Republic was at war with Spain. To avoid being identified with the Spanish enemy, these refugees from the Iberian Peninsula called themselves Portuguese Jews. There were three Sephardi communities originally which merged in 1639 to become Talmud Torah, the Portuguese Jewish Community of Amsterdam, which still exists today. 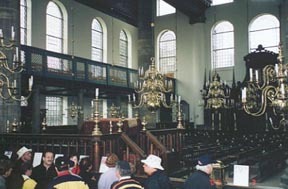 The Portuguese Synagogue (esnoga) at Mr. Visserplein 3 was inaugurated on August 2, 1675. Wooden piles support the building and the foundation vaults can be viewed by boat from the water underneath the synagogue. Around the main edifice a row of low buildings house the winter synagogue, offices, archives, homes of officials, the rabbinate, a mortuary and the world famous Ets Haim Library. The layout is of the longitudinal Iberian-Sephardi type with the arc and bema at opposite ends of the interior while the seating is divided in two, the halves facing each other and separated by an aisle. The floor is covered by fine sand in the Old Dutch fashion, to absorb dust, moisture and dirt from shoes and to muffle noise. In 1940, 140,000 Jews lived in Holland. Today there are 20-25,000, with 15-20,000 in Amsterdam. One of the big mysteries is why the Portuguese Synagogue remained undamaged by the Nazis. Not to visit the Van Gogh Museum, Paulus Potterstraat 7, is not to visit Amsterdam. This is the world's largest collection of works by Vincent Van Gogh with more than 200 paintings, 500 drawings and 700 letters. Also presented are works by artists admired by Van Gogh, such as Paul Gaugin and Georges Seurat. Our final stop of the day was the Amsterdam Biblical Museum, situated in two canal houses at Herengracht 366. The museum houses a number of temple models, the oldest dating to 1730, showing the attempts that have been made through the centuries to determine the actual appearance of the temples of Solomon and Herod. Archeological finds from Egypt tell a story of the People of Israel in Egypt and of their exodus. Religious objects from the Jewish and Christian traditions demonstrate faith and worship throughout the ages. The heart of the Biblical Museum is naturally the Bible itself.